Okay, so I haven’t tasted it yet, but I’m already smitten. 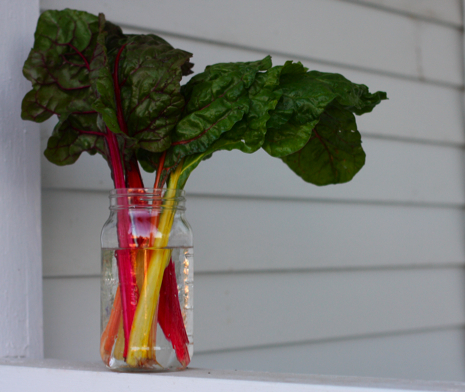 This week’s CSA farm share included this beautiful, bright swiss chard. I love the way the stalks look in the recycled pear jar I like to keep around and use as a vase. Nutritious eye candy. Perfect. Now I just have to figure out how to cook it. Any suggestions? Hey Craft Club, pals! (Do any of you actually read this?) I have some exciting news. 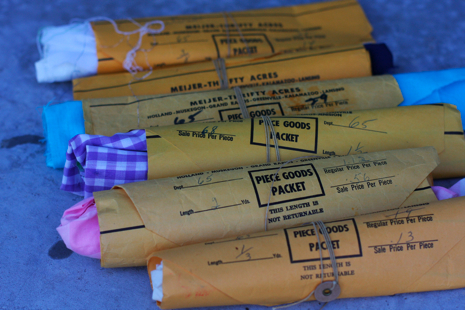 We got a huge fabric donation from the mother of one of my Press coworkers. (Three laundry loads worth.) Some of the loot is fabulous vintage and we get to use all of it for community craft projects and to get our craft on for charity. I’d like to start setting up some group quilting sessions soon. Let me know if any of you are up for that. Okay, time to do some English paper piecing. I want to get to work on an Amy Butler skirt, but I’m too tired to follow directions right now. Darn. I really want to make a new skirt with an apron overlay. It’s going to be awesome.